Palmer died of pneumonia at Brighton, England. 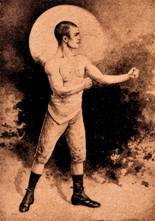 Known as “Box O’ Tricks”, Pedlar Palmer was from fighting stock. His father was a bare knuckle champion of Essex, and it was said his mother could handle any women in London’s East End !. Pedlar was an elusive and extremely clever boxer who developed into an extravagant showman with moves learned in a boyhood stage act with his brother. He won bouts advertised as for the world 100lb title in 1893 against Walter Croot and Mike Small, and was acknowledged as world bantamweight champion in 1895 when he beat Billy Plimmer of Birmingham on a 14th round foul. He boxed a draw with the world featherweight champion George Dixon in New York in 1896 and kept his bantamweight title through five defenses against Johnny Murphy, Ernie Stanton. Dave Sullivan of Cork, Plimmer and Billy Rochford. 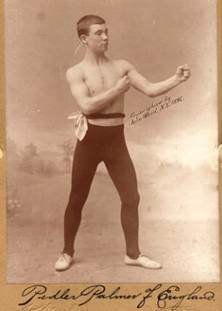 Palmer lost his title in Tuckahoe, new york in September 1899 when he claimed that he was blinded by the lights when Terrible Terry McGovern knocked him out in the first round. He was then still only 22 years old. Life remained a source of adventure for Palmer even though his skills faded as his liking for drink took its toll. He lost the British bantamweight title to Harry Ware in November 1900 and although e won two out of three fights with George Dixon and beat Digger Stanley, another world champion, he was twice beaten in British featherweight title fights by Ben Jordan and Joe Bowker. In 1907 Palmer killed a man on a train to Epsom races and served four years for manslaughter. On his release he boxed again but his great days were over.For the last 20 years of his life he was a bookmaker in Brighton. ON SEPT. 1, in the arena of Westchester A. C., Tuckahoe. N. Y., I hope to win the title of bantamweight champion of the world. That has been my ambition ever since I began to fight, and I have worked hard and faithfully to attain it. As Pedlar Palmer is the acknowledged bantamweight champion of England, and I am certainly the best man at the weight in this country, the winner at our meeting next month may surely claim the right to call himself champion of the world. Of course, when I have beaten Palmer, I shall not rest content, but will seek higher honors. But of that I will speak later. First of all, I want to say something of how I am training for my go with the Britisher and why I am so confident that I can defeat him. As for all my previous encounters, I am training for the coming battle at Fleetwood, which is on the northern outskirts of the city of New York. There are several reasons for my choice of this spot for preparing for my contests in the ring. It is near New York and Brooklyn, where most of my contests have taken place and in which I have business interests and yet is far enough from the latter city, which is my home, to prevent a lot of fellows being continually around my training quarters. Of course I like to see my friends occasionally while I am training, to vary the monotony of the work, but it is bothersome at times to have outsiders continually around and is apt to interfere and take one's mind off the real business of the day. As I have been fighting at short intervals for the past two years, I was in pretty good shape when I started in this time. As a matter of fact, whether I have a fight arranged ahead or not, I always do a certain amount of athletic exercise every day and thus keep in trim. Besides which, I never smoke or chew tobacco and don't indulge in intoxicating liquor of any sort, except an occasional glass of beer, when in training, so as to have "something to work off. If I didn't drink beer when preparing for a fight, I should be apt to "dry out," as the saying is, and so go stale. I get up in good time every day, and after a light breakfast I take a short rest and then go out for a 10 or 15 mile walk. While out I alternately walk, then sprint for a short while or jog along for a mile or so. When I get back to my quarters, I am ready for dinner, which is plain, but varied from day to day. During the afternoon I punch the bag or skip the rope for several hundred times. The latter is one of my favorite- exercises, as it is a wonderful aid to a fellow in developing staying power. Sometimes I vary the monotony by boxing a few rounds with" Charley Mayhood, my trainer, or with Tim Kearns, who is my sparring partner. After the next ten day or so, when the date for the fight is near at hand, I shall drop all but the lightest work, just enough, in fact, to keep in good trim without getting over trained. It is practically impossible for me to tell you what tactics I shall employ against Palmer. As any fighter of experience knows, one has to study an opponent and then go at him by directing the attack on that point which seems to be the most vulnerable, or where he gives the best opportunity for an opening. However, I'll venture to make the same prophecy in regard to the result of my fight with Palmer as I have before every one of my previous encounters, and that is that if Pedlar has not licked me by the end of the first three or four rounds I'll win sure. I do not say this in a. spirit of bravado, but because I thoroughly believe what I say. My reasons for this belief are as follows: A glance at Palmer's record will bring to light the fact that the majority of his victories have been gained by outpointing his opponent, whereas, if you look up my career, you will see that most of my battles have resulted in my adversary being knocked out. Now, from this I argue that, while Pedlar was much cleverer than any of his opponents, yet he could not hit hard enough, as a rule, to knock them out. I am considered to the hardest hitter for my weight in the ring today, besides which, I think I can claim credit for considerable ability as a boxer. Consequently I am certain that Palmer will not have enough steam behind his blows to knock me out, and I am willing to receive a good deal of punishment for the sake of getting him to leave an opening so that I can land a few good ones on my own account. If I get the opportunity, and I am sure I shall, I guarantee that an American will be the next bantamweight champion. As I can hit equally hard with either hand, it makes no difference to me on which side the opening comes or which fist lands the blows. I don't want any one to imagine from' the foregoing that I am not well aware that I am going up against the hardest proposition I have yet tackled and the man who is credited with being the cleverest bantamweight in the business; but, as I have endeavored to convey, he is essentially an extremely clever and scientific boxer, while I am first and foremost a fighter, with a good knowledge of the art of self defense, and thus have the better of it if previous battles under the same conditions are any criterion. I may here mention the fact that in none of my fights have I had my nose bled or an eye blackened and in other respects have hardly received a mark. Now as to my plans after I have won from Palmer. I shall immediately sail for England, as I think there will be more money to be made there than over here, and I think I shall be entitled to all I can get of it. Palmer gets $500 a week for appearing in the London music halls, and as his conqueror I ought to get more for the same thing, besides which, I shall give exhibitions throughout the larger towns of the country. When my tour there is over, I shall return to America and after some exhibitions will set to work to prepare for my fight with George Dixon the featherweight champion, which will take place in December or early in January. After that, well that’s a long look ahead and I leave such matters to my manager. Tuckahoe. N. Y.. Sept 12. Terry McGovern. the American lad defeated Pedlar Palmer of England In one round, fought here today to settle the world bantam-weight championship. The winner also gets $7.500 of the $10.000 purse hung up, the balance going to the loser. McGovern was the favorite In betting, a large amount of money being offered at 100 to 80 and later 100 to 70 to the American. Tom O'Rourke challenges the winner to meet George Dixon at for $5.000 a side. Paddy Sullivan. Oscar Gardner's manager, challenges the winner on behalf of Gardner at any weight from 114 pounds up. Palmer's seconds say he -weighs 118 pounds. McGovern's seconds say the American Is about 117 pounds. Palmer led with his left and fell short Terry touched him lightly on head. Palmer led again. Terry stepped back and Palmer fell to his knees. They mixed up at close quarters and Terry landed his right twice on the jaw and then brought it down to the wind, at the same time keeping his head inside of Palmer's swings. The time-keeper made a mistake and rang the bell when the round was half over, but the men quickly went back as soon as the mistake was discovered. The men stepped quickly to the center of the ring, Terry sent right and left to the head, then with a left hook he dropped Palmer to the floor. Palmer In getting up seemed groggy and Terry forced him to the ropes. McGovern was over-anxious to finish his man and worked very roughly for the head, but the English lad, though half groggy, ducked beautifully. Terry never let up, however; but kept hammering with both hands at close quarters. Palmer was in a half crouching attitude and got to a clinch. As they broke, McGovern hooked his left hard and viciously to the Jaw, driving Palmer's head back, and as the Britisher staggered towards the ropes. McGovern swung his right to the point of the chin and Palmer dropped helplessly. He struggled frantically, but was unable to rise, while Siler stooped over him and mechanically tolled off the seconds. 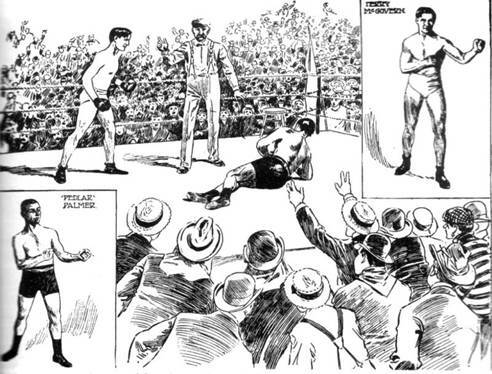 When the referee had counted five, Palmer threw his right hand towards the lower rope of the ring, but failed to clutch It, and then rolled over on his back. He rolled back again on his side and leaned on his elbow when the referee shouted ten. The crowd then began cheering- wildly when they saw that the Englishman was beaten, and the Briton's second looked very disconsolate and struggled through the ropes and carried the defeated pugilist to his corner. Palmer revived quickly and was helped out of the ring within three minutes after the knock-out blow had been delivered. Meanwhile, McGovern's friends were almost crazy. Many of them Jumped toward the ring. but were prevented from entering it by the sheriff's deputies. Two of his friends climbed through the ropes and presented him with a floral horseshoe. Before McGovern left the ring half of the spectators shouted to him to give them a flower, and within a moment the floral piece was a total wreck. McGovern went to his dressing room after Palmer had left the ring, but had great difficulty in getting through the crowd, as everybody seemed to be anxious to grasp the winners hand. 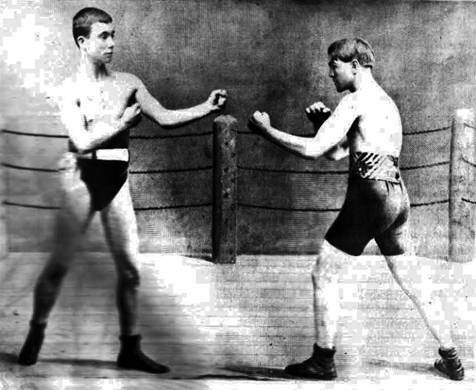 Harry Harris defeated Pedlar Palmer In their fifteen-round fight for the bantam championship of the world before the National Sporting club of London, England, yesterday evening. Four times during the go Palmer was groggy and the gong saved him. The rounds were three minutes long. Harris' share of the money was $500 and there was a $1000 side bet up of which Harris gets a liberal allowance. Harris will tour the music balls with Sammy Kelly before returning home. The claim will be made that this was not a legitimate championship bantam battle. Palmer lost to McGovern, it will be remembered, after the fight was postponed a day in order that the picture might be taken. The weight limit of 118 was discarded. The men came In at catch weights and McGovern won in a hurry. The men were not bantams but through it McGovern claimed the bantam championship of the world. The "Pedlar" did the greater part of the work in the first round. The American was wary. In the second round there was a great deal of holding. In this round "Pedlar" played for the body and got in several blows which would have staggered any ordinary man. but Harris appeared to be callous to either body or head blows. In the third round Harris began to wake up and showed his clever left, with which he did most of his fighting. In the fourth round "Pedlar" changed his tactics and worked for the head of the American, but he received a stinger in the ribs which made him grunt. From this point Harris began a series of upper-cuts which "Pedlar" could not solve. In round five there was a lively exchange of blows, both hitting viciously at the jaw and both taking punishment freely. Harris tried a hard upper-cut which just missed by a fraction of an inch. Had he landed the fight would have ended there. Palmer kept landing in his opponent's stomach. In the next round the American "with a hard uppercut nearly knocked out Palmer, who was very groggy, but managed to land in exchange. This was the most spirited round of the fight, and when it was over it became evident that the American was the far better man of the two. He kept getting in hooks and jabs to the jaw which perplexed the Englishman. From this time on it was a question whether Palmer would last the fifteen rounds. The lean and lank American kept driving in piston-rod jabs. In this and the following rounds he continually worked these tactics on his stocky opponent, who vainly tried body blows Once Harris got a jab which rocked him, but he simply shook his head and battled on. "Pedlar" looked discouraged, and thereafter merely sparred to last the fifteen rounds. The interest began to lag and at the end of the fifteenth the lank American boy was, amid great applause, declared the winner. Harris indeed won, but an uglier boxer, or one more disrespectful of all the classical boxing rules, never entered the doors of the National Sporting Club. Pedlar Palmer is true to old England. Not only in his diet does Palmer follow the English usage, but also in his training. in active training for a fight. fights two men the same way. In his bout he is guided by instinct. He is a born fighter, not a boxer. injury to the hands and feet when trying to develop new blows. Palmer has no favorite blows, and his opponent may receive a swing from any direction.